In 1798 Napoleon Bonaparte persuaded the ruling Directory of France to invade Egypt. In truth the Directory were pleased to see the famous young General go. Napoleon’s successful Italian campaign had made him a popular figure in revolutionary France, a potential threat to the rule of the Directory. In 1798 Egypt was nominally part of the Ottoman Empire and ruled by a puppet Pasha representing the Ottoman Sultan Selim III. In practice it was ruled by the Mamelukes, warrior slaves mostly originating from the Caucasus region commanded by Murad Bey. Early in 1799 Napoleon decided to invade Syria (including modern day Palestine, Jordan and Isreal). The fortress at El Arish was captured followed by Jaffa and by 17 March the French occupied Haifa. The campaign was halted at Acre defended by the Ottoman governor supported by Sir Sidney Smith who improved the natural defences of the city that stood on a peninsular. In April the Pasha of Damascus sought to relieve the siege with an army of 30,000 men but was defeated by Kleber and Napoleon at Mount Tabor. With the failure of the the final assault at Acre and news of a planned invasion of Egypt from Rhodes, Napoleon withdrew from Acre on 14 May. After a grinding march back across the Sinai Desert he arrived back in Cairo on 14 June. Kleber had no intention of staying in Egypt and following Ottoman landings at Damiette and an invasion from Syria he began negotiations with the British and the Grand Vizier. However, the draft convention was not approved by the governments and so Kleber advanced and defeated the Ottomans at Helipolis on 20 March 1800. He followed up his victory by driving the Ottomans from Egypt before he was assassinated on 14 June. Menou took over command. 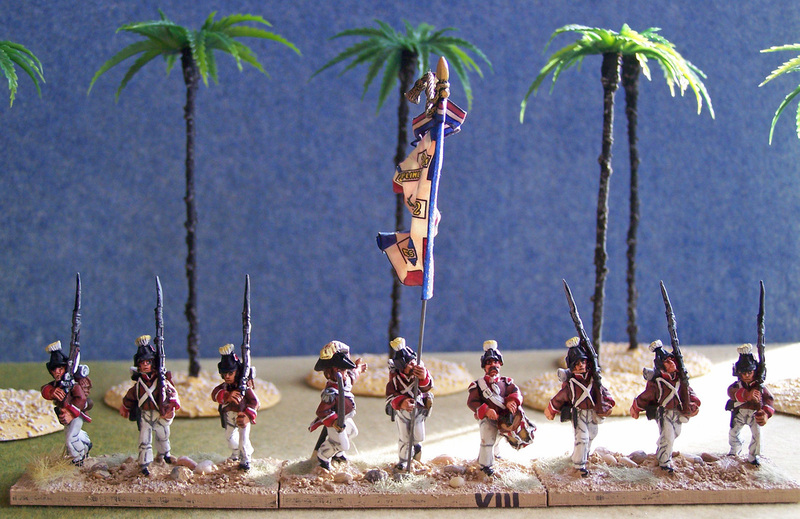 The British decided to intervene and an expeditionary force under Abercromby, landed at Aboukir Bay on 8 March 1801. After beating off an attack on the landing beaches the army advanced and captured the French defensive position at Mandora (Canope) on 13 March. The battle took place on 21 March near the ruins of Nicopolis, on the narrow spit of land between the sea and Lake Aboukir, along which the British troops had advanced towards Alexandria. The British position extended across the isthmus, the right resting upon the ruins of Nicopolis and the sea, the left on the lake and the Alexandria canal. The line faced generally south-west towards the city, the reserve division under Major-General Sir John Moore on the right, the Guards brigade in the centre, and three other brigades on the left. 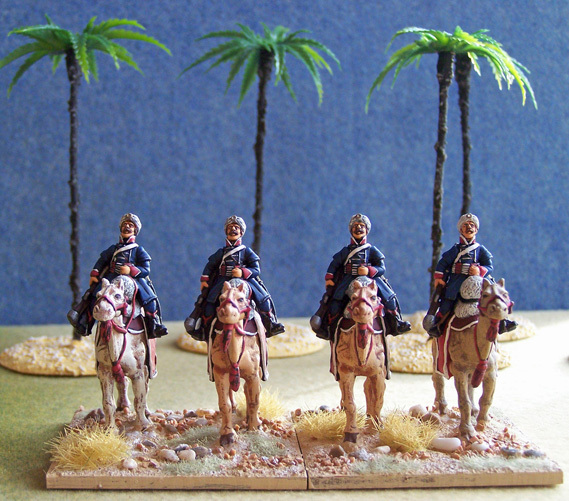 In second line were two brigades and the cavalry. At 3:30 a.m. the French attacked and drove in the outposts. The brunt of the attack fell upon Moore's command, and in particular upon the 28th Foot. The British repulsed the first shock but a French column penetrated in the dark between two British regiments. A confused fight ensued in the ruins, in which the 42nd Black Watch captured a colour. The front and rear ranks of the 28th were simultaneously engaged, whereby the soldiers received the order "Front rank stay as you are, rear rank about turn". The conduct of the regiment won for it the distinction of wearing badges both at the front and at the back of their head-dress. In a second attack the French cavalry inflicted severe losses until repulsed by the Guards, but the French cavalry for the second time came to close quarters with the reserve. The battle petered out by ten. After the battle the British besieged Menou in Alexandria whilst sending a force to capture Cairo. The French capitulated on 14 September and were repatriated to France. The French Army of the Orient was organised as the standard revolutionary army with infantry in Demi-Brigades of around 1700 men supported by light cavalry and dragoons. Artillery included a siege train, 72 field guns and 24 howitzers. On embarkation the army was equipped in the uniforms of the period but conditions in Egypt soon forced changes. These included a black leather peaked cap for the infantry called the "petits-casquettes" together with lightweight cotton or linen tunics. 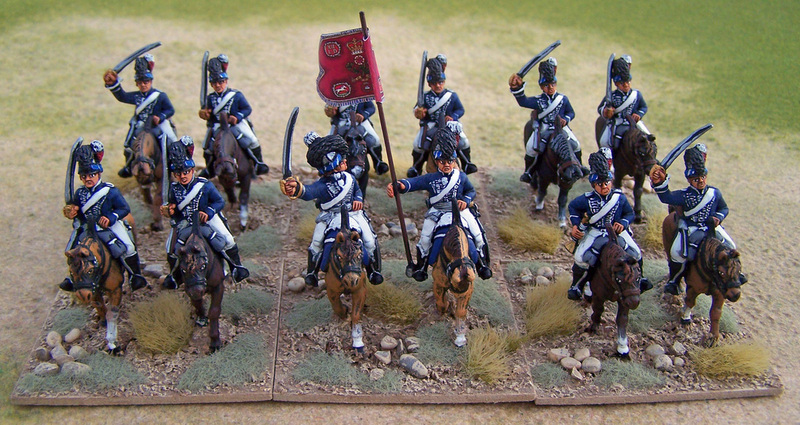 These changes were confirmed in the Kleber Ordance of 1799 that resulted in a variety of colourful uniforms. Specialist units included the Regiment de Dromedaires and locally raised forces from the Greek and Coptic communities together with some Mamelukes and even Janissaries. The chief local opponents of the French were the Mamelukes. These included the flamboyant Mameluke horse, together with local Ottoman forces including Janissaries and Sipahis. They would be supported by Bedouin Arabs from the desert tribes and mobs of fellahin some armed with little more than clubs. Ottoman invasion forces included the usual Sipahis horse and Janissaries together with Albanian and Moroccan infantry. The British intervention force included 7 brigades of foot including a number of regiments of foreign troops and three units of dragoons. 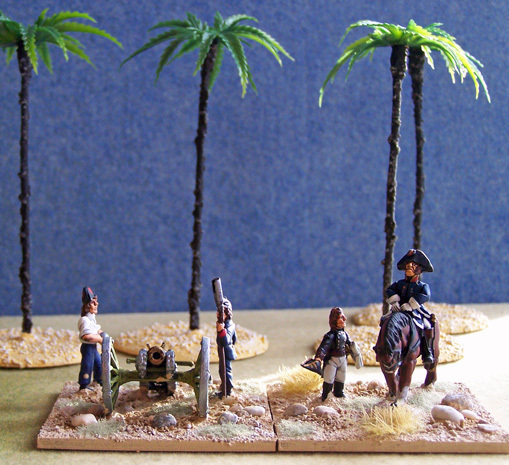 The French wargame figures in this display game are 28mm figures mostly from the Old Glory and Dixon ranges. 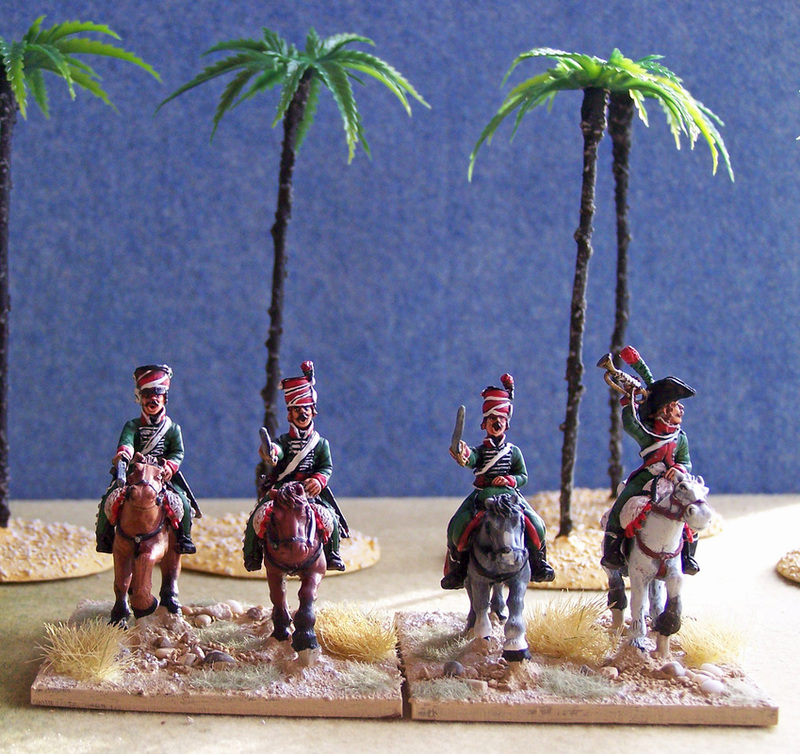 Other figures are from Trent Miniatures and a new range from Britannia. 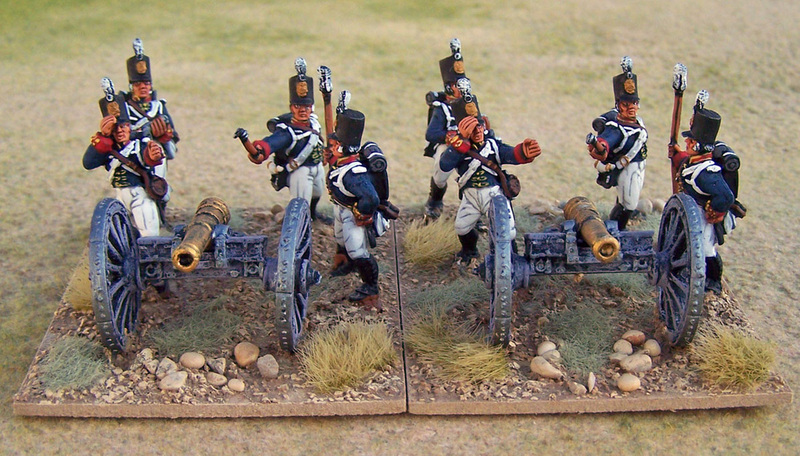 The British are from Front Rank and the new plastics by Victrix. The rules are Black Powder.